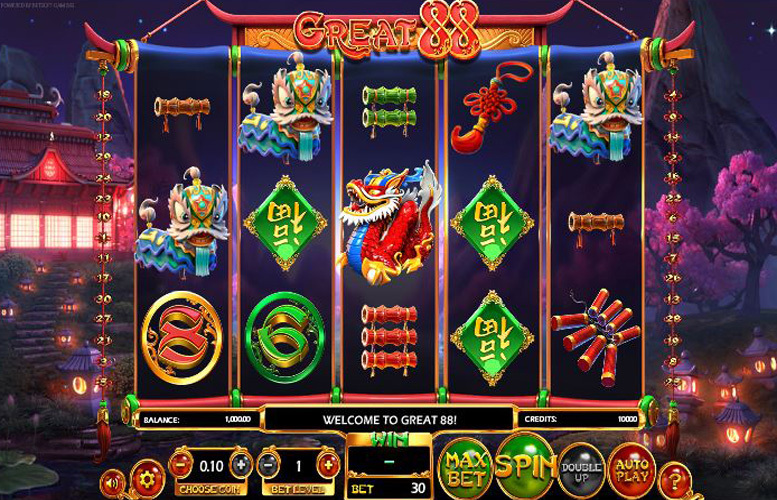 Great 88 from BetSoft is another traditional Chinese themed machine. The background is a fantastic representation of a pagoda at night, and all the symbols throughout have been lovingly illustrated. The game lacks some of the more extravagant animations we’ve become accustomed to from BetSoft titles but the fact that there’s a chance to win over 1 million credits easily makes up for this. If you’re a fan of top heavy, Asian-themed slot machines. This one could be ideal for you. High top jackpot, and bonus win potential. This is something of a break from tradition for BetSoft. Great artwork, theme, and music. These combine excellently to create a slot with visual appeal, and a strong atmosphere. Strong set of gameplay features. The varying bonuses from the Lucky Boxes make for a constantly varying experience. Outrageously low upper betting limit. We’re not sure how BetSoft can even justify this but we’d love to hear it. “Wild” firecrackers = 8,888x the line bet. Dragon = 1,000x the line bet. Lion = 600x the line bet. Jade toad = 500x the line bet. Red symbol = 300x the line bet. *The game lists the chance to win over 1 million credits per spin – only possible in feature rounds. Landing three or more Lucky Boxes anywhere on the reels will reveal “Great Rewards”. These include: top symbols, instant wins, firecracker wilds, free spins, and a spin on the bonus wheel. 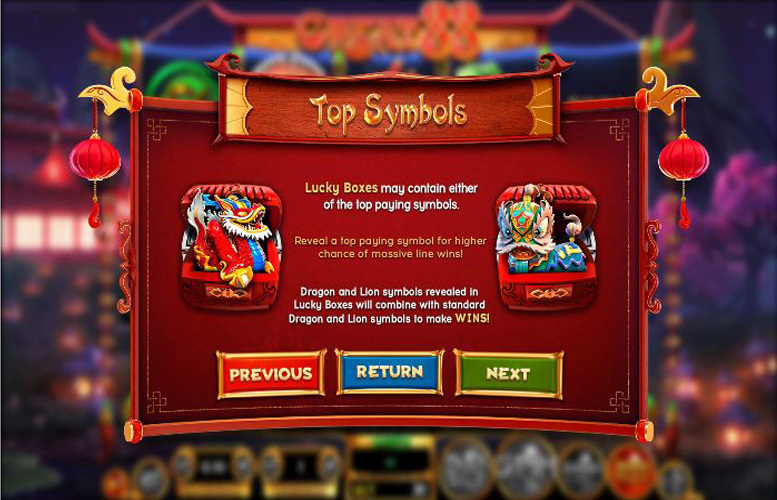 Top symbols: Lucky Boxes may contain either of the top paying symbols. These can combine with other top jackpot symbols on the gameboard for a chance to win big. Instant wins: The “instant win” bonus is represented by Bronze Coins appearing from a Lucky Box. Each box may reveal between one and three coins. Players receive their total stake multiplied by the number of bronze coins they undercover. Firecracker “Wilds”: Lucky boxes may contain Firecracker “wilds”. As each firecracker explodes, it will spread to one or two other symbols. This will turn them wild too. Free Spins: Lucky boxes may contain Jade Coins. 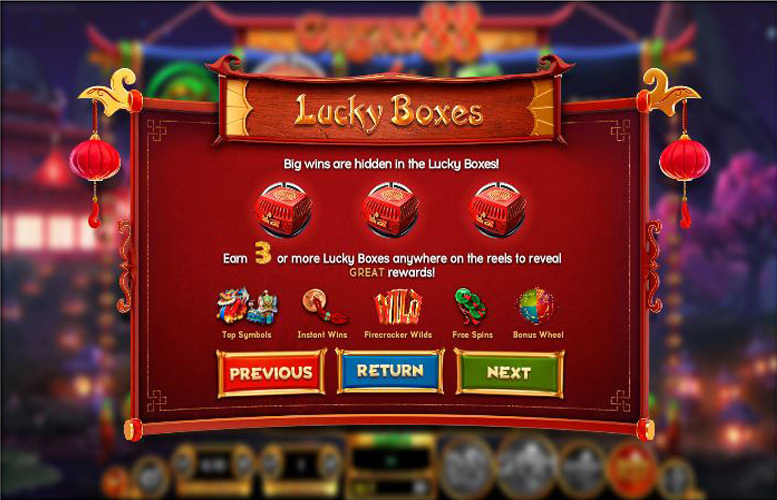 Each lucky box may reveal one, three, or five Jade Coins, and may trigger between three and 25 free spins. Players should note that Lucky Boxes will not appear during the free spin bonus. Bonus Wheel: Lucky Boxes may each contain a Golden Dumpling. Each Golden Dumpling awards a spin on the Bonus Wheel. The prizes are eight free spins, 5x the total stake, 10x the total stake, 20x the total stake, and a spin on the “Mega Win Wheel”. Players can win over 1 million credits in a single spin. The Mega Win Wheel can be triggered from the Bonus Wheel. There are various prizes on offer on the Mega Win Wheel. These are: Mini Mega Win (100x the total stake), Big Mega Win (750x the total stake), or the Giant Mega Win (6000x the total stake). Hitting the “double up” button after any standard win will trigger the coin toss side game. 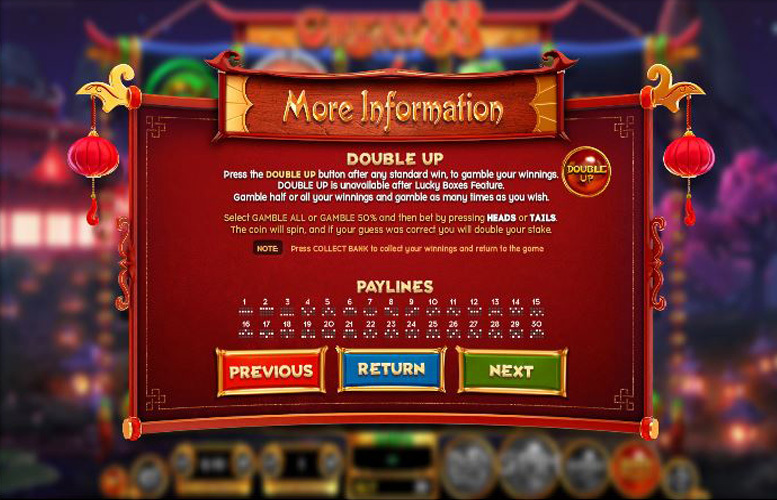 Here, players must select whether they wish to gamble all or half of their winnings on the result of the flip of a coin. They must then select “heads” or “tails” and await the outcome. If they guess right, they double their stake. If they guess wrong, they’ll forfeit it. Play can continue so long as there is money to gamble, or until the “collect” button is hit. 8 symbol = 200x the line bet. 6 symbol = 100x the line bet. Green or red diamond = 50x the line bet. Any bamboo = 25x the line bet. Players are given a great deal of control over how they distribute their wagers on Great 88. They can alter the value of every coin between 2p, and a curiously small 10p. There is also the option to choose how many coins are bet per line. Here, the minimum is one and the maximum is five. Unfortunately, it isn’t possible to adjust the number of win lines playable. With all values set to the minimum, the lowest possible bet per spin is just 60p. Meanwhile, the maximum bet possible for every turn is a bizarrely small £15. Whilst we know that BetSoft favour smaller betting limits than most machines, we think this is far too restrictive. Despite its laughably low upper betting limit, Great 88 is a fun game to play. It features several innovative gameplay features, and the prize pool is top-heavy – a real rarity on BetSoft Games. The whole package is solid. From artwork and music to bonus rounds, the designers thought of everything – except to provide a reasonable maximum bet per spin. This game has a rating of 7 / 5 with 864 total reviews by the users.